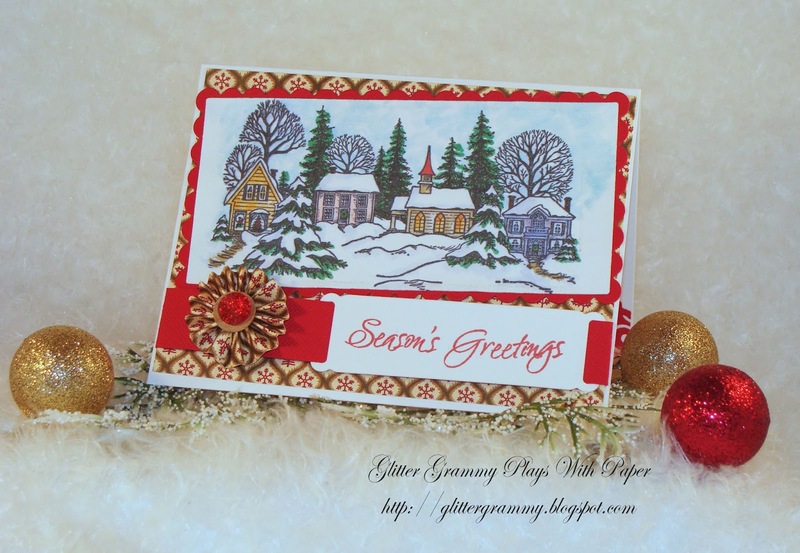 Glitter Grammy Plays With Paper: Sparkles Christmas Challenge - November! Already! Sparkles Christmas Challenge - November! Already! Oh my, where did October go? Honest, even though I've not posted for a month, I have been really, really busy! Before I go any farther let me tell you this month's Sparkles Christmas Challenge was chosen by Debs and the theme is Decorations. Mine might be a stretch, as it is a card, with a decoration. I'm on a rosette kick of late....thank you Karen, Deb and Chris....so, my decoration is the tiny rosette! I had a bit of time to color, so I did! You can check out the ins and outs at: Sparkles Christmas Challenge. I'm looking forward to see what you create! 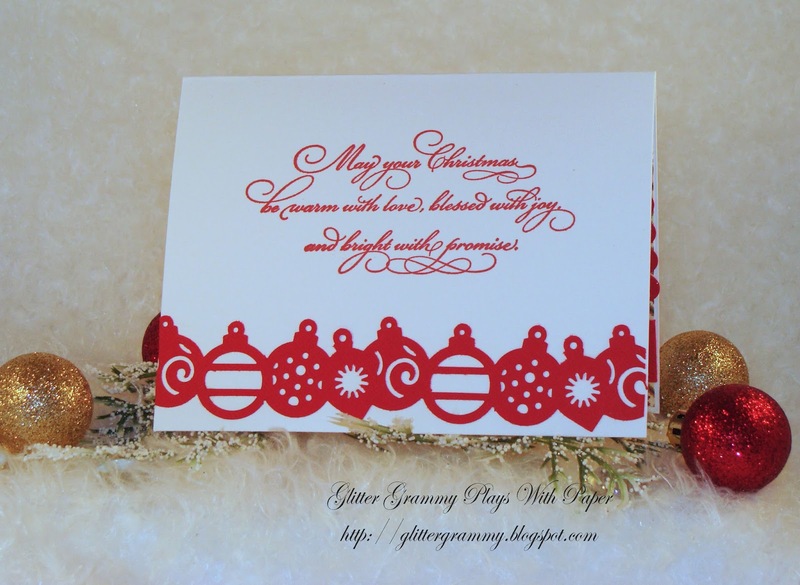 Ok, so here is the inside of my card....you know me, it isn't done til the inside is complete! Remember I said I was on a rosette kick? Well let me tell you why.....Karen - Paradise Scrapbook Boutique - had aa 2 day anniversary crop. 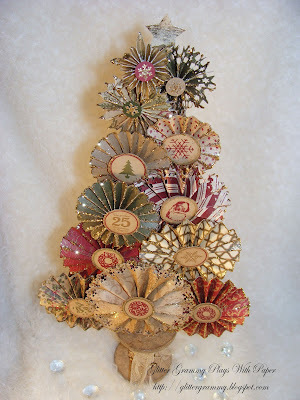 She gave us projects we could make with the beautiful paper pad.....One of the projects is a rosette Christmas Tree that she and her sister Deb created. The finished tree is about 18 inches tall....not too big and not too small! 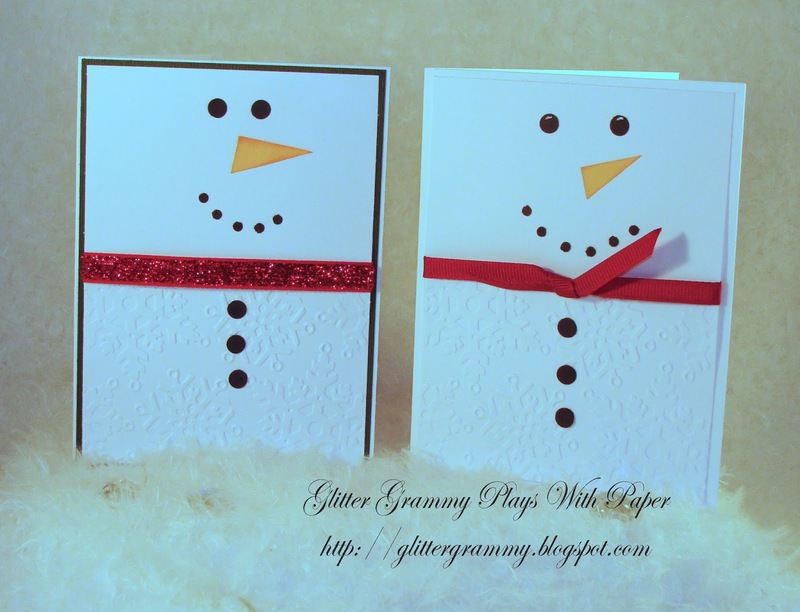 And, I've been playing with two snowmen cards. 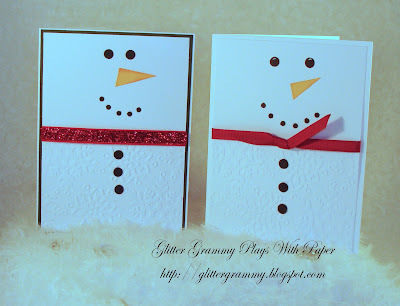 I saw the pattern on Pinterest, but I forgot to pin it, so this is what I think it looked like.....These two snow people were quick, easy, and flat for mailing! So see, I have been busy......and if I want to get my tree finished, I'd best get moving! Sending wishes for a happy crafty week. Mary, I love the cards and the Christmas tree is stunning. Hello Lovely Lady . . . my, you HAVE been busy. Lots of love festive projects to see here.